Its our last day of our Christmas Giveaway! We really hope you have enjoyed yourselves. Christmas is now 11 days away! 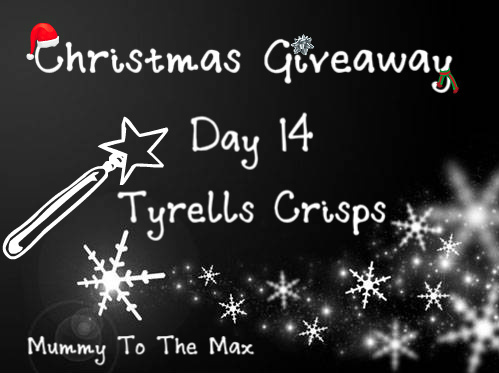 Our final prize today has been donated by Tyrells Crisps who have kindly donated us some lovely festive crisps. 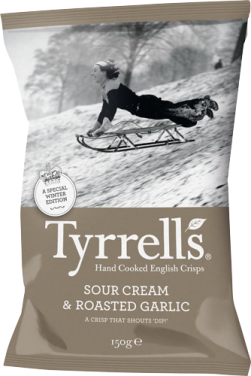 Tyrrells encourage you to embrace the English winter with the launch of its limited edition seasoning of potato crisps – a Sour Cream and Roasted Garlic flavor. Tyrrells Hand Cooked English Crisps are made from small batches of Lady Claire and Lady Rosetta potatoes which are all farmed and then cooked on the farm. Another fab prize. Thank you for running these comps, good luck everyone. Sad that the giveaways are ending! Thanks for a great Christmas set of competitions. 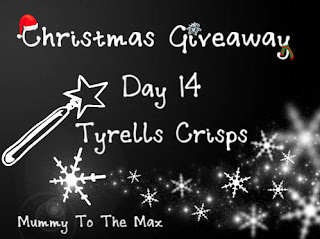 Another great giveaway, I LOVE Tyrrells crisps! That sour cream and roasted garlic flavour looks lovely. Mmmmm! Great competition and love these crisps! yum, would love to try these. Sour Cream and Roasted Garlic sounds fab! thank you for all the xmas giveaways, merry xmas to you.